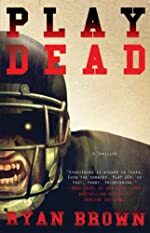 Variety is reporting that the film rights to Play Dead have been acquired by Mark Canton (Trapped, Taking Lives, The Spiderwick Chronicles), who has hired Joe Schreiber (Chasing the Dead, Eat the Dark) to write the screenplay. The darkly comic zombie thriller, which was published earlier this year, is Ryan Brown's debut novel. For the first time in Killington High School history, the Jackrabbits football team is one win away from the district championship where it will face its most vicious rival, the Elmwood Heights Badgers. On the way to the game, the Jackrabbits’s bus plunges into a river, killing every player except for bad-boy quarterback Cole Logan, who is certain the crash was no accident—given that Cole himself was severely injured in a brutal attack by three ski-masked men earlier that day. Bent on payback, Cole turns to a mysterious fan skilled in black magic to resurrect his teammates. But unless the undead Jackrabbits defeat their murderous rival on the field, the team is destined for hell. In a desperate race against time, with only his coach’s clever daughter, Savannah Hickman, to assist him, Cole must lead his zombie team to victory. Read the first chapters of Play Dead below.